Western dressage integrates the historically validated principles of dressage with the best of Western stock horse tradition. It is a systematic and progressive system of training for the Western horse and rider in traditional stock tack with the purpose of enjoying a safe, pleasurable, versatile, and useful working horse. The hallmarks of the Western dressage horse are usefulness, rideability, willingness, safety, pure gaits, lightness, calmness, and steadiness. A Western dressage rider should be attentive and tactful. They should use clear, effective, subtle aids coupled with a confident seat and light, responsive hands in communication with their horse. A Western dressage partnership should exhibit impulsion originating from deeply engaged hindquarters transmitted without resistance through a supple topline to a light, soft contact with the rider’s hand(s). The horse should move freely forward, laterally, and to the rear via a willingness to work off the hindquarters, which enables the Western horse to be a useful working partner. A Western dressage partnership should culminate in a happy, harmonious horse and rider relationship. Western dressage tests provide the opportunity for horse and rider to demonstrate growth through a series of progressive elements by advancing from test to test and level to level as they develop in physical skill, mental maturity, and partnership. Competitions are both rewarding and educational, with judges providing scores and offering feedback for each element, as well as for collective marks demonstrated throughout the test. 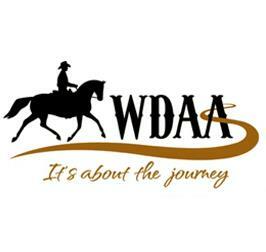 The mission statement of WDAA is to build an equine community that combines the Western traditions of horse and rider with Classical Dressage. WDAA honors the horse, values the partnership between horse and rider, and celebrates the legacy of the American West. A guideline of legal and illegal equipment when competing in Western Dressage classes. Document outlining the different competition licensing options for Western Dressage competitions. Application to host a Competition Lite licensed competition. A list of judges eligible to officiate Western Dressage at Competition Lite competitions. If you have any further questions please feel free to contact Cailin Bridges at [email protected] or 859-225-6939. USEF has added an additional show called Competition Lite. This new structure was created to provide another avenue for competitions to be licensed with US Equestrian while experiencing a modified application of some of the rules. If you have any further questions please feel free to contact Cailin Bridges at [email protected] or 859-225-6939.